Welcome to Zimbabwe | Where is Yvette? When it turned out that my overland trip in Southern Africa would end in Victoria Falls, Zimbabwe, I can’t say I was certain what to expect because of all the stories you hear about on the news these days- nations associated with words such as “hyperinflation” and “cholera epidemic” and “lowest life expectancy rate on Earth” (37 for men, 34 for women) do not exactly sound like premier destinations. But people on the ground said “Vic Falls” is safe so I decided to trust them. I should also note that about two weeks after I went to Zimbabwe the main story I saw that day on BBC News was about how they were finally back in Zimbabwe and showing the conditions. So on the other hand of the above advice, I have officially visited places the BBC doesn’t dare go! Wimps. 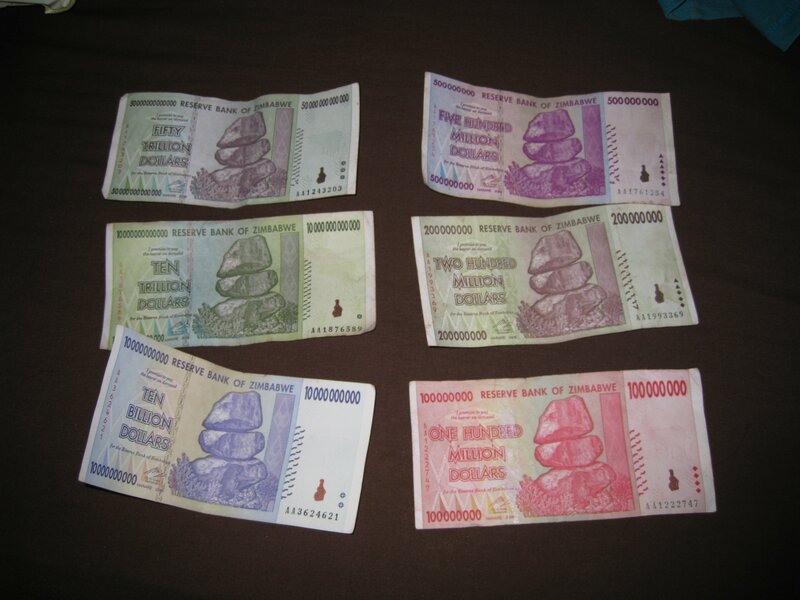 The reason Zimbabwe is such a bad place to live these days can be seen above- hyperinflation. The notes above, all printed in 2008, range from ZA$200 million to ZA$50 trillion, which if you stop and do the numbers is the same as going from $1 to $100,000 in a year. Obviously these notes are worthless now- they stopped printing the notes this past April because they literally ran out of paper to print the money on, and the Zimbabwe dollar ceased to exist on July 1, about two weeks before we were there. Nowadays everyone uses American dollars or South African Rand in the country, and you need to bring in all your currency as there is no money in any of the ATMs. Makes for interesting planning. So what is the effect of such massive hyperinflation unparalleled anywhere else in the world? Well the way to imagine Zimbabwe these days is it’s in a state of decay- when a window breaks you just cover it up because you can’t purchase or even find the glass you need for a new pane, and when you can’t afford money to treat the water anymore you get a cholera epidemic. (To be fair the epidemic does not exist in Victoria Falls, but everyone showered with their mouth shut to be on the safe side.) Even in a tourist town like Victoria Falls some of the big expensive hotels had collapsed roofs because there’s no way to get new thatch or pay people to re-thatch the roof. As a result of the hyperinflation, you can’t assume on any given day that you’re going to get the supplies you need to survive, as everything even very basic needs to be brought in from outside the country. 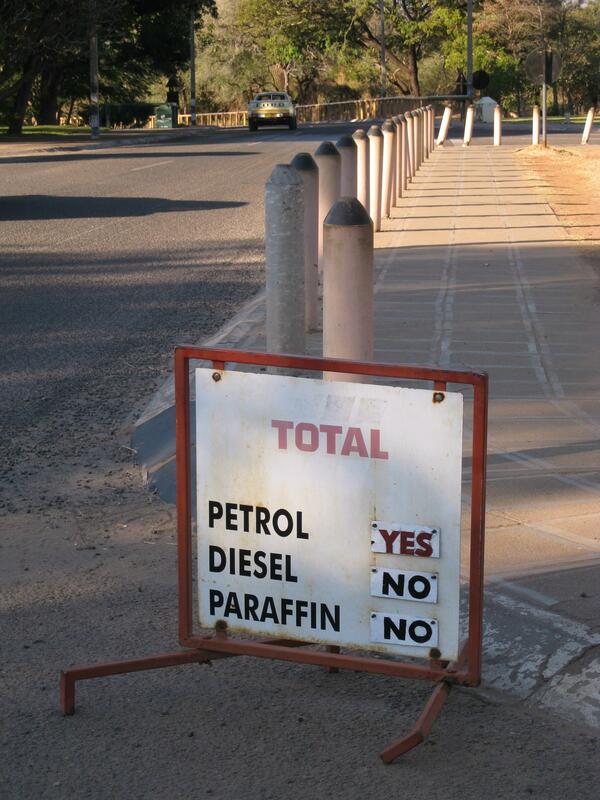 This is the sign at the Victoria Falls gas station- they had diesel the day before, but guess they ran out. No paraffin on any of the days we were there, which is a pretty basic thing to have when the electricity is known to cut in and out erratically. Of course there’s only so much I can say about the current situation in Zimbabwe because I only went to one town in it, which was a tourist town on the border at that. Having said that I think my heart would absolutely break at seeing the conditions in the rest of Zimbabwe, because the only word I can use to describe the people there is desperate. Absolutely desperate, to a degree I did not come across even in Asia or other places in Africa. Take going to the market. My sister and I had heard you can barter for souvenirs at the market with old stuff you don’t need anymore, so we took her pair of six-year-old tennis shoes to see what we could get for them. We couldn’t have gotten a better reaction had we showed up at the market with a bar of gold- every person at that market greeted us with a “hello sister,” breathed down our necks, asked if we wanted something if we so much as looked at it, and generally harassed us more than I ever have in any other 3rd world market before. My sister and I were lucky we were able to speak in Hungarian before, but we needed to make up code words for things that sounded too similar to English pronunciation because the hawkers would latch onto any small indication that we might be interested (elefant became a szurke, “the gray one,” for example, hippos became “the fat one”). We also said we were from Hungary instead of American when asked- God help us if we ponied up on that detail- but one guy decided to give us the standard “oh Hungary, I love that country and have friends who live there!” shpeel. “Do you even know where Hungary is?” I asked in an exasperated tone, getting pretty worn out by the harassment by this point. “No, but I’d rather be there than here,” he pointed out, and I really couldn’t argue about that. Anyway, pictured above is the lucky guy who got my sister’s old shoes, which we exchanged for two beautifully carved sets of stone bookends and a stone soap dish, the whole lot probably worth US$100 in the rest of the world. (I just typed “the real world” actually but deleted it- we often forget stuff like this is in the real world!) I took this picture after we confirmed the deal and immediately he became overjoyed that this was his lucky day- said the shoes were for his wife- and became the nicest guy you could imagine. You’ll run into this a lot in Zimbabwe by the way- you will be harassed within an inch of your life because you’re probably spending more in a few days than many will have in a year because there’s 80% unemployment, but once they realize it’s a good day they relax and smile and engage in great conversation. Two brothers even threw in a pair of necklaces and showed us a shortcut out of the market as a gesture of goodwill. I spent my weekend in Zimbabwe enjoying the Falls and doing various adrenaline activities I will outline in a later post. 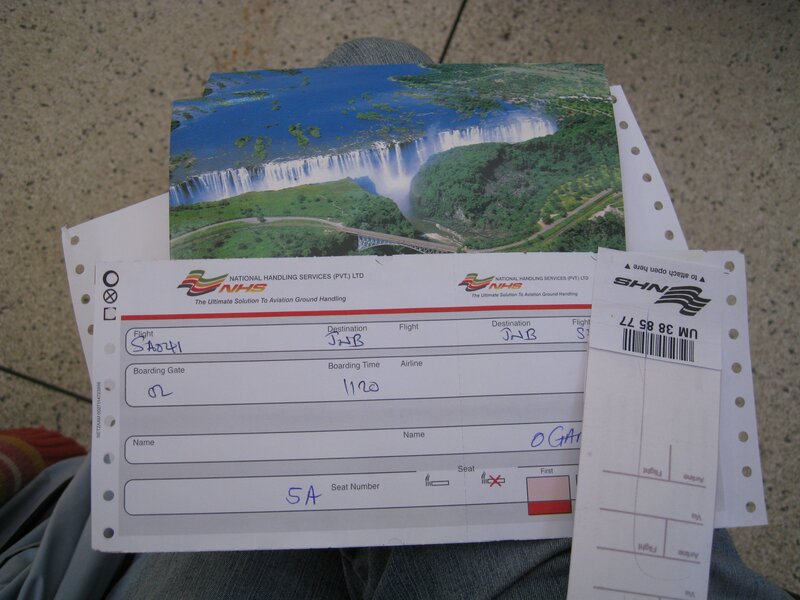 But as the final note on the “current situation in Zimbabwe” post, it should be noted that I while getting into Zimbabwe was pretty easy (hand over US$30, you are handed a visa to stay as long as you like), I had a surprisingly hard time getting out. See my handwritten airline ticket above for the flight to Johannesburg, complete with handwritten luggage check of the same type, which I got at the counter next to the giant old definitely-not-digital balance scale. I had an electronic ticket for the flight, and it turns out if you’re doing so you need to make sure you document it within an inch of your life because (obviously) the computers were down. So we needed to call Johannesburg for me to get on the flight- lucky the phones were working!- so I was luckily able to get the hell out of Zimbabwe. The other object in my lap there was one of two postcards my sister and I purchased for US$2 each, probably the most expensive postcard I have ever purchased especially when compared to the prices of everything else in the nation. Why so expensive? Because they’ve ceased printing Victoria Falls postcards, of course, so if you want one you’ll need to pay dearly for it. What a heartbreaking country. I cannot think of any nation on Earth where I wish the people a better life and future more than Zimbabwe. This entry was posted in RTW #1, Zimbabwe. Bookmark the permalink. I am curious as to how you learned Hungarian. Did you learn it growing up in a Hungarian speaking family-the best way?